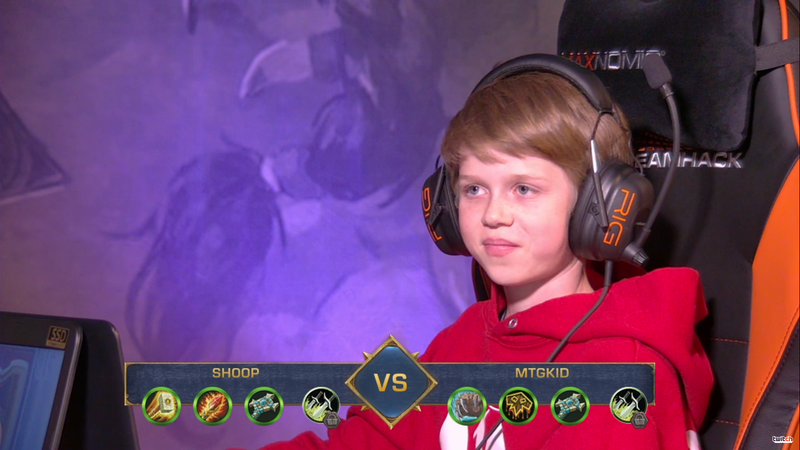 During yesterday’s Hearthstone matches at DreamHack Denver, the commentators mentioned a player called “MTGKid” between matches. A young kid, MTGKid is actually Quinn Kiefer—a 12-year-old Magic: The Gathering player. Quinn is part of the Kiefer family, one of several young Magic-playing siblings that have made waves in the past year. With brothers Lukas and Jack, the three have been taking wins at tournaments like SCG’s and even starting to break into the Grand Prix. Being Colorado natives, it makes sense that one of the boys might find their way to Denver to try their hand at Blizzard’s virtual card game. Kiefer went 7-2 in his Swiss round Hearthstone matches, in what was reportedly his first Hearthstone tournament ever. Running a tournament standard line-up of Druid, Shaman, Priest, and Rogue, Kiefer had been doing fairly well. That is, until he got matched against David “Shoop” Steinberg in the first playoff round. Steinberg is a strong player, having taken the first place finish at DreamHack Austin 2017 and strong placings in several other tournaments. Steinberg was faced with a dilemma: to advance in Denver, he was going to have to beat a kid at Hearthstone. In their games, Steinberg’s curve was often in his favor, getting key cards like Raza and Anduin down right when he needed them. Across three games, Kiefer couldn’t manage to make headway against the DreamHack Austin champ. Despite an undesirable finish in the top 16, Kiefer had an auspicious first outing in Hearthstone. If the Kiefer talent holds strong, he will probably be destroying everyone in this game in no time at all. In the mean time, it looks like Kiefer has already got back on the horse at Denver. If you’d like to watch the whole match between Steinberg and Kiefer, you can find the VOD here. You can also head over to DreamHack’s Hearthstone channel to watch the rest of the playoffs as they play out into the evening.